Sennelier inks, which are likened to Indian inks, are available in a selection of high quality colours. 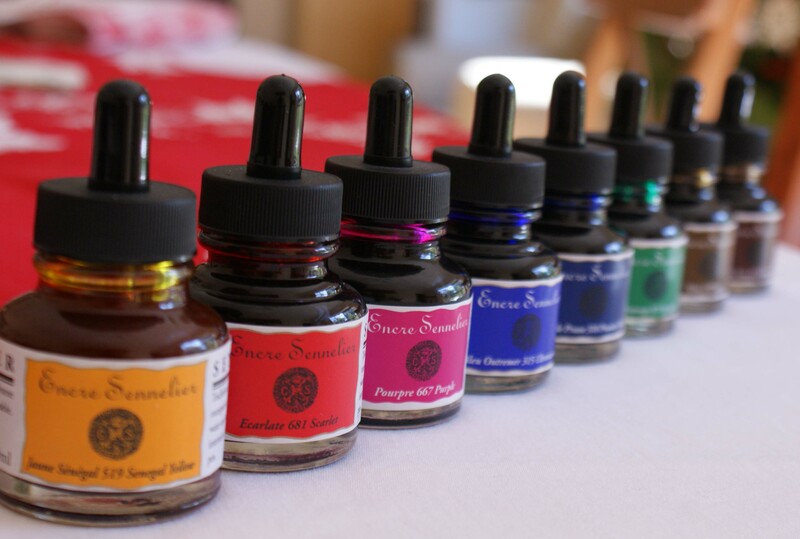 Extremely rich, these inks are manufactured with shellac gum giving them a unique brilliance and brightness. They can be applied with a brush or ink pen and give a satin to brilliant film depending on thickness. The colours are blendable and can be reduced with a shellac-based thinner for various techniques. They dry rapidly and display a high degree of water resistance, without being indelible. These inks are highly sought after for calligraphy, quill drawings, washes, for textile creations and materials research. They can be protected with a pencil fixative in order to increase their light stability. 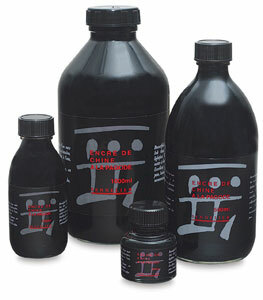 Sennelier Indian Ink is a beautiful deep black ink that is indelible and lightfast. When diluted with water it becomes less indelible. Excellent for calligraphy nib pens, brushes and airbrush. Not recommended for fountain pens.